от 10 шт. — 190 руб. от 20 шт. — 176 руб. Добавить в корзину 1 шт. на сумму 330 руб. 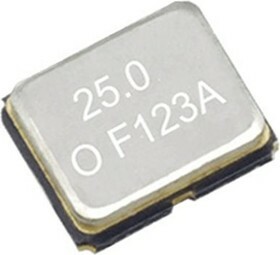 SG-210STF crystal oscillators are a compact 2.5 x 2.0 mm SMD package size, CMOS output, 1.6 V to 3.6 V supply voltage. They have an output frequency range of 1 MHz to 75 MHz and Standby function. These SG-210STF SPXO crystal oscillators have low current consumption, excellent phase noise and an operating temperature range of -40 to +105°C.